The search for a premier E-Waste Recycling Solution Provider is over. Let All Green be your ultimate partner in disposing of your old computers, printers, mobile phones, TV sets, and other electronic equipment in the City of Industry. To address the e-waste problems in the City of Industry professionally, you have to trust All Green Electronics Recycling. Our ITAD Solutions are reliable, credible, and proven. We can help you gain 70% from the net resale profit. Destroying all sensitive information and data is a crucial task which we're capable of doing perfectly for you. Our Equipment Destruction process is secure and certified. We will make sure that your brand is well protected. 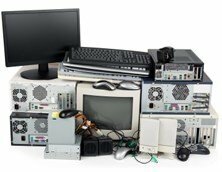 The availability of All Green Electronics Recycling in the City of Industry is helpful for people who want to recycle, reuse, remarket, and even donate their old electronics. Our e-waste services are all premium and tested. We’ve been in this field for many years now, an indication that we are capable of doing what has to be done in order to help in the protection of the environment. To put it in simple words, our Electronics Recycling City of Industry Services are what you’re looking for if you want to successfully recycle your old laptops, or mobile phones, or any other electronic devices. City of Industry is located in the San Gabriel Valley region of Los Angeles County, California. It is an industrial city that is home to over 2,500 businesses and 80,000 jobs, but has less than a thousand residents. Do you want to help keep this city clean and e-waste free? If yes, then it’s right time for you to schedule an e-waste pickup with All Green. Our e-waste services are tested, reliable, and premium. You can entrust your electronic devices if you want them to be successfully remarketed after the refurbishment process. We have all the techniques at hand. You can count on us when it comes to reducing the cost of technology replacement, because we will pay you 70% as your share from the total resale net revenue. We have an extensive network of recycling partners and agents, which will justify our reliability and trustworthiness. Try to schedule a pickup right now, or if you can’t, you can find a near drop-off location. We will be doing our best to help protect the environment from the danger as caused by cadmium, copper, nickel, mercury, lead, iron, and other metals present in e-waste being irresponsibly dumped in the landfills here and abroad. The map shown above is where our e-waste services are made available. You can start participating in the responsible e-waste disposal campaign in the world today. Choose from our services listed below. For more information about All Green services, please feel free to contact us right now.